Gold and silver mining in Atlanta, Idaho, dates back to 1863, when a team of prospective miners led by John Stanley discovered gold along Yuba River. Despite attempts to conceal this discovery, word got out and a small gold rush to the area happened in August of 1863 that failed to yield any significant discoveries. Some miners stayed in the area, and continued exploring the placer deposits around the area. In 1864, there was a second gold rush that was much more substantial than the first. Most of the mining activity extended from the Yuba River downstream along the Middle Fork of the Boise River. Additional discoveries were soon made to the south at Rocky Bar on Bear Creek and within the Feather River drainage. This was during the height of activity taking place to the west in the Boise Basin, and thousands of men were exploring the rugged mountains in this area in search of new gold deposits. The discovery of the Atlanta lode in 1864 established this area as rich in mineral wealth. Until 1867, placer mining was the primary mining methods used along the Yuba and Boise River. This was attributed to extreme remoteness of the mining district and difficulties in bringing milling facilities to the district. The remote location of the lode was a challenge. Refractory ores also stalled production of gold. When stamp milling began in 1867 the production really began. In 1868, investors from all round the world started flocking to Atlanta. First on the scene were British investors. They were followed by Monarch, a company owned by investors from Indiana. It was primarily gold that was being mined at Atlanta. Improvements to save silver by both investors proved unsuccessful. There was little that could be done, and the failure of stamp milling didn’t help matters. The Atlanta silver was refractory to a point where attempts to recover gold were uneconomical. As a result, all the mills ground to a halt by the end of 1869. Failure in major attempts to extract minerals at the Atlanta Lode didn’t deter other investors. The ore was rich enough to attract many other large mining companies. Monarch was the most profitable company operating in Atlanta operating at the head of Quartz Gulch. While there were other promising producers, the owners held on to them in the hopes of finding a solution to the recovery problem. Other mines around Atlanta include the Minerva and Tolache Mines. What Atlanta needed was improved transportation and infrastructure to increase mining activities. This, however, was nearly impossible without more capital investment. In 1874, investors from Buffalo acquired a discovery lode that was an extension of the Atlanta Lode. The new discovery was later named Buffalo in 1874. Mining activity didn’t start on the extension lode until 1877 after a ten stamp mill was shipped to the area in 1876. This marked the beginning of a booming industry in Atlanta without most of the challenges faced before. This is despite of the fact that only high grade ore milling had good returns. 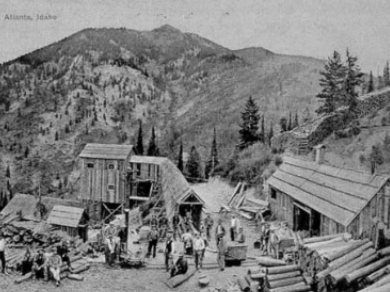 Between 1877 and 1884, gold production was at its peak. At one time, the Buffalo mill produced $14 million in gold. Atlanta eventually began being plagued by economic collapse when creditors began suing one another. With the richest ores becoming worked out and the economic boom coming to an end, mining activity in the camp stalled until the early 1900’s. Major improvements, such as the set-up of an amalgamation-floatation concentrator in 1932 and the construction of a road that ran from Boise to Atlanta in 1936 marked the beginning of modern mining in Atlanta, The problem of refractory ore was finally solved and the area could be assessed without much difficulty. Today, there is still a decent amount of mining activity in Atlanta and there are still many private mineral claims in the area, major mining activity. Some prospective companies have taken a renewed interest in Atlanta, using modern techniques to rework tailings from past mining operations. They are in the process of acquiring permits to revive mining. Atlanta gets a fair amount of tourism in the summers, due to its relatively close proximity to Boise. It can be accessed by a long drive up the Middle Fork of the Boise River starting at Lucky Peak Reservoir, but it is much easier to access it from the south side from the Anderson Ranch road up through Pine and Featherville.